Hello mes amis! Hope you're all happy and healthy! In today's post, I'm reviewing Help: Clear Skin*, a skin care supplement intended to clear acne blemishes and breakouts. I've used the product for a month and watched my skin's reaction in the weeks following my trial. Did it work for me? If you've been following my blog for a while, you may know that I have always struggled with breakouts or "wACNE" (wack + acne), but don't often talk about it, as it is very personal and also very frustrating to talk about. While my blog is mostly about cosmetics, we all know that covering up your skin with makeup doesn't solve the issue of "wACNE", so today I'm diggin' a little deeper. Help: Clear Skin was sent to me as a trial, and although I was excited to try out a new product, I was also a bit apprehensive. I've always used topical solutions, but never before tried an oral supplement (other than vitamins), so this was essentially my first time "ingesting" an acne treatment. Help: Clear Skin supplement contains natural lactoferrin, a milk protein, which has been clinically proven to reduce the development of the bacteria responsible for many skin impurities, helping to prevent the formation of blemishes due to its antimicrobial effects. My Skin: Prone to mild acne and occasional clusters of breakouts. 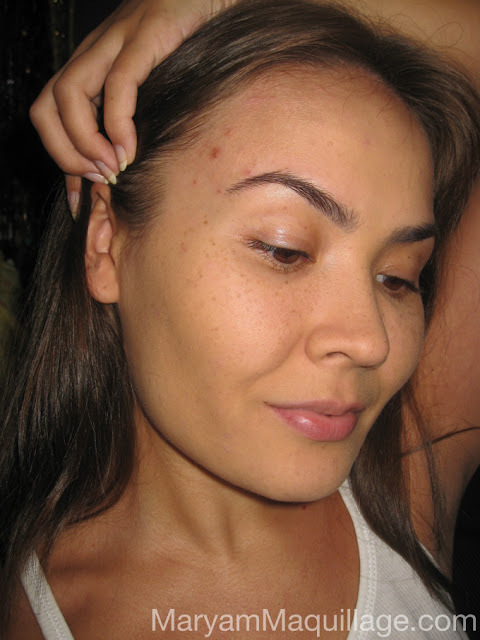 The photo above was taken at the beginning of my trial: my skin was generally pretty clear with the exception of a few painful pimples on the left side of my forehead. In my case, such clusters usually take several weeks to heal and leave dark acne scars that take another few weeks to disappear. One box of Help: Clear Skin contains 7 sachets of white powder to be mixed in with food or liquid. 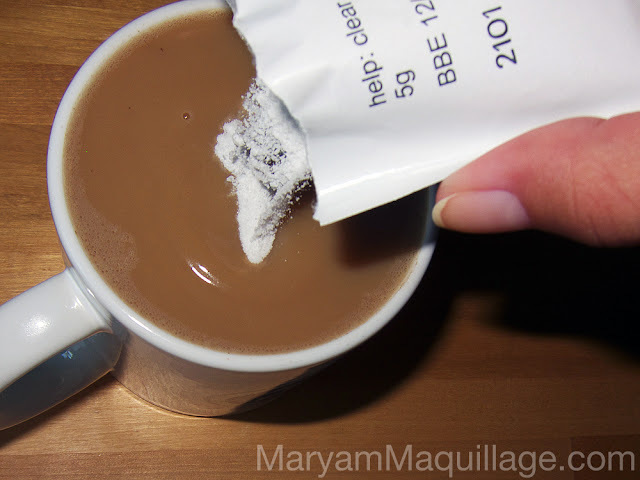 The powder is absolutely tasteless, so I added it to my morning coffee, every day for a month. PROGRESS: By week 1, I started to notice my forehead cluster clearing up and didn't see any new formations on other areas of my face. My skin was completely clear by week 2 and by week 3, it was so healthy and luminous, that I even felt empowered to take / post photos without any foundation (see here & here). By week 4, I became really confident and even ate foods that typically cause me to break out immediately when combined together (such as cheese & chocolate). Side note: I'm not sure if the following was the result of a placebo/nocebo effect, but the one day I forgot to take my packet was the day that I got a huge zit right smack in the middle of my forehead (thankfully it cleared up within a couple of days). RESULTS: My skin stayed clear for exactly 1 week after finishing the month trial and sadly reverted back to its old ways shortly after. The pic above was taken about a week and a half after the completion of the trial, and you can see a cluster of pimples on my jawline and forehead (the pic was taken right out of the shower, so the flush you see isn't related to any skin conditions). This tells me that the product does, indeed work, however, it's not a long term solution, but more of a daily regimen for your lifestyle. With a week supply costing £8.33 (around $13, not including shipping) I'm not sure this is the most affordable solution for acne, however, I will say that it works, and I think we can all agree that we can't put a price on clear skin. Q: Have you tried Help: Clear Skin? Q: What acne solutions have worked for you? *The product/s in this post were sent by said company for my use and consideration. This is not a sponsored post. I have never tried this or anything similar, even though about 2-3 years ago I had problems with my forehead area and I was trying almost everything to get my skin clear again. Fortunately Queen Helene Mint Julep Mask did wonders to my skin and I haven´t had the problems any more. Queen Helene is amazing!!! I had a major horn grow on my forehead last night, so I spot treated overnight with Mint Julep and voila -- it's gone! This product looks very useful for those who suffering with acne but i would suggest every girl to consult your dermatologist before applying anything on face. I have an acne prone skin and staying away from oily food, constant cleansing and loaaaaaads of water have been helpful in keeping it at bay. I have noticed that whenever I get lazy on cleansing routine.. acne is back! I suppose this plus good diet helps a lot as well. I am also using aesop masks for acne, i find the masks really good at drying up the pimples. You're still stunning. But, I'll tell you what worked for removing my zits, Barleans Mango peach fish oil and zinc caps. After my lil guy, I broke out in the most horrible cystic acne. Once I began taking the fish oil and zinc caps, gone! I am so gonna look into the Mango fish oil and zinc caps... it even sounds like it works!! With all of the heavy makeup I've been wearing lately my skin has been in absolutely horrible condition! I'm always extremely apprehensive to try out new skin care products because I don't want a reverse effect but drinking it instead applying directly to my skin seems like something I'd give a try! OMG I'm obsessed with your mom lol!!! That is awesome -- you must lead such a healthy and holistic lifestyle!! wow! great post! thnx for sharing! it worked for me for the 4 weeks that I used it, but after that, womp woooomp... zits came back! A nice and informative blog for the readers for the taking. The blog is very helpful for the people on the topic. Skin is a very sensetive parts of our body .n We should keep it clear. I think it is a helpful website where you find many suggestion about keep clear skin. You also find and know about many kind of skin care product.